Discipline is generally not a word we like to use. For many of us it carries some negative connotations. When we think of discipline, we tend to think of time-outs, “groundings”, spankings, or other forms of punishment we received as children for misbehaving. But the root word from which we derive our English word discipline has very little – if anything – to do with the idea of punishment. Discipline comes from the Latin root disciplina, meaning ‘instruction’ or ‘knowledge’. One of its cognates is discipulus which translates to disciple (learner) which is the Latin translation for the Greek word of the same meaning mathetes – a word that shows up many times in the New Testament. The word does still carry some of this root sense when we apply it to the field of higher education today when we speak of various “disciplines” or fields of study; but for the most part its general use immediately brings to mind the concept of punishment or correction. That being said, correction certainly has a place within discipline and learning (“we learn from our mistakes”) but cannot and should not be so narrowly defined. Thus when we come to speak of the “Spiritual Disciplines” many in our Western world may get their backs up a little at the thought of the word. Recent cultural shifts in the last 30-40 years have carried households away from ‘discipline’ in its limited sense to a more free-flowing lifestyle. The goal in our culture seems to be freedom from all constraint. The idea persists that anything that restricts us inhibits our ability to feel happy or fulfilled. Jesus Christ did indeed come to set us free (John 8:36), but he did not come to grant us freedom without boundaries. Freedom without boundaries breeds chaos and confusion. Healthy and appropriate boundaries enable us to thrive as God continues to shape us into the likeness of his Son. Though Jesus was God in human flesh, he still operated within boundaries “He did not consider equality with God something to be used to his own advantage” (Php. 2:6; NIV). The freedom we receive from Christ is freedom from the power of sin and death; freedom from self-centred living in order that we might live for God and live life to the fullest (John 10:10). Unfortunately, many churches in the West have been influenced by this worldly notion of freedom and its aversion to discipline. The grace of God is exalted over and above the justice of God; pushed in it is meaning far beyond what God through Christ intended. If God were all grace and no justice, then Jesus would not have had to die on the cross. Conversely, a God who is all justice and no grace is the aloof god of deism – disinterested in the goings on of humanity, but eager to punish them for all their sins. In reality, our God is a God of both grace and justice. His justice demands punishment for sin, but his grace takes the punishment of that sin upon himself in our behalf through Christ. But, as the apostle Paul reminds us in his letter to the Romans, God’s doing this does not give us carte blanche to live however we choose without consideration of the consequences: “What shall we say then? Shall we go on sinning so that grace may increase? By no means!”(Rom. 6:1-2). Paul’s response to the question is the most emphatic way you can say “NO” in ancient Greek. For, he goes on to say, “we are those who have died to sin; how can we live in it any longer?” (Rom. 6:2). In fact, as the author of Hebrews reminds us – God’s discipline – shaping us – is actually a sign that we are God’s adopted children! (Heb. 12:7-8). The author has a great deal more to say about God’s discipline that I cannot possibly cover here, but I encourage you to read for yourself Hebrews 12:4-13. When we are children, we have parents to discipline us (shape us). But when we grow up and move out of the home, we are beyond the scope of their discipline. Does this mean that because we have “grown up” that we no longer need discipline of our lives? Of course not! God will certainly discipline us through our circumstances, and oftentimes through our faith community – if we are willing to accept God’s discipline. But as disciples of Jesus we also have a responsibility to discipline ourselves – to instill discipline into our lives in order to create the space for God to shape us. This is where the Spiritual Disciplines come in. The Spiritual Disciplines have been around for thousands of years – practiced by many a saintly sinner throughout the history of the church. 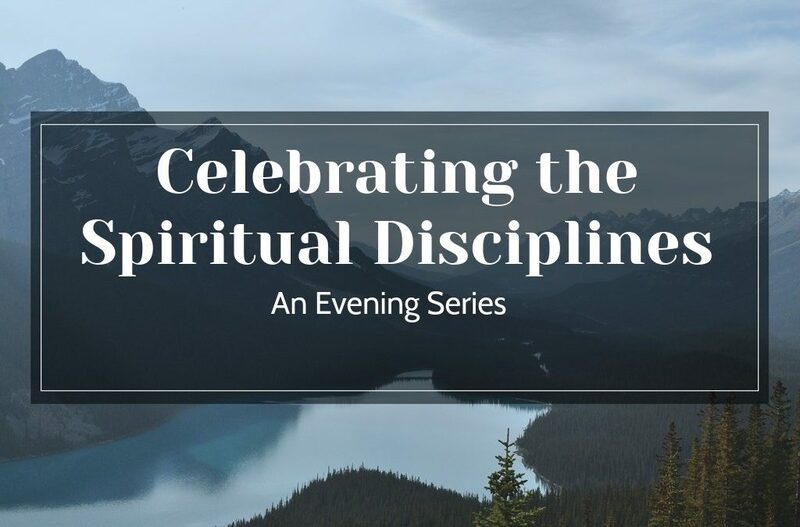 In our evenings together for the next while, we will be covering twelve of these disciplines based on the book The Celebration of Discipline by Richard Foster. * So far in this series we have covered the disciplines of meditation, prayer, and this past Sunday, study. Embedded in this post are downloadable versions of the slides from those three messages. I hope to periodically post the slides from the messages as the plan is to have some practical guidelines included in every message. As we journey through this series together and seek to implement the Spiritual Disciplines in our daily lives, my God use them to shape us more and more into the likeness of Jesus so that he may receive the glory for all that we do. *Another excellent book on the rationale for practicing the Spiritual Disciplines is The Spirit of the Disciplines by Dallas Willard.